I am in love with Spanish wine, especially Rioja. This isn't the first time I've shared this sentiment, and I'm sure it won't be the last time, either! Wines from Rioja reflect high quality and craftsmanship, while offering accessibility for all wine lovers at reasonable prices. The Conde de los Andes Blanco 2015 is composed entirely of the Viura varietal. An intriguing vibrant gold colour in the glass, melon and vanilla aromas invite you in to a complex palate that also offers notes of kiwifruit, fresh pear and a hint of white blossom. The tannins are fine-grained and well integrated, with mouthwatering acidity leading into a long, bright finish. This is a stunning sipper that would marry well with a wide variety of savory foods, and has the potential to age in cellar for 5-10 years. The Valserrano Rioja Reserva 2012 carries a bouquet abundant with red fruit, molasses, and hazelnuts into a body consisting of prominent yet velvety tannins and a smooth, rich body. The uncompromised quality and care the family takes in crafting their wines is clearly evident with each sip. The true highlight of the reception was the CVNE Imperial Rioja Reserva 2014. This stunning treasure boasts a lush, full body, silky-smooth tannins and racy acidity, combined with flavours of red currants, plum and black olives. The finish is long and sultry, with a hint of baking spice. Pairs well with a myriad of cheeses and charcuterie, but also fantastic on its own! Special thanks to Tiffany Pence, Dhane Chesson and Ana Fabiano for their wonderful hospitality and passion for sharing Rioja wines with the world. 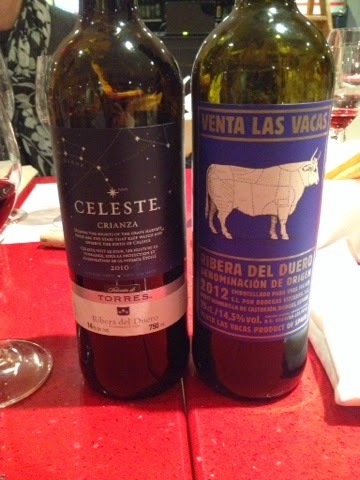 I used to think that the quality of Spanish wines wasn't comparable to French and Italian wines. I once mentioned this to a fellow winelover at a Vintage Port tasting I attended with him a couple of years ago. He laughed, and said I must try more of them to really appreciate the wine's quality through it's terroir, and "bang for your buck". I am so glad I listened to him! Over the past few years, I have found some wonderful Spanish gems, and after focusing on more Spanish wines in the past month, here are some of my personal favourites with a few other producers to try out. -Rioja: The most well-known region in Spain, oaked red wines made from grape varietals Tempranillo and Garnacha (aka Grenache) are produced here. The Ribeira del Duero and Toro also feature some wonderful expressions of Tempranillo. -Catalunya: This is where Spain's signature sparkling wine is produced, called Cava. 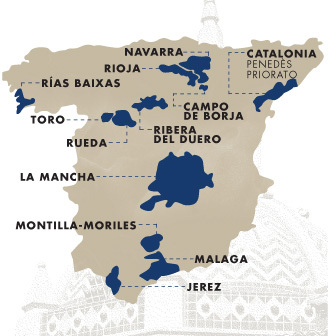 Some notable wine appellations nearby are Priorat and Montsant, which offer red wines with elegance and structure. -Rias Baixas: The maritime climate coupled with mineral-rich soil is the perfect homeland for a white wine called Albarino, which carries aromas of stone fruits and melons combined with a mineral structure and zesty finish. August 1st was considered "Albarino Day" in the winelovers' world, and my sister-in-law and I celebrated with an interesting take on the varietal. Deep gold in colour, the Pirueta contains aromas of honeydew melon and orange blossom tied into a palate of underripe pear and grapefruit. 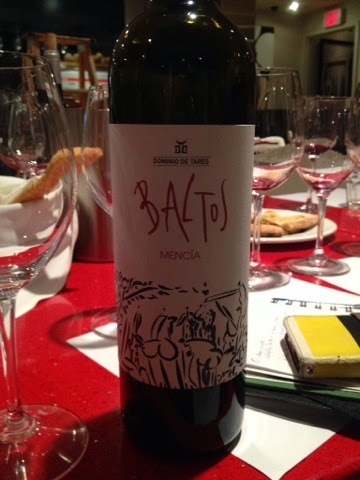 The body shows more weight than most Albarinos, with a blend of mouthwatering acidity and zesty finish. Pairs extremely well with lighter cheeses like havarti. Another good Albarino to try is Paco & Lola, which is lighter in style and offers flavours of red apple and crisp citrus. The label is created to catch your eye in store, adorned with black and white polka dots! The "dog days of summer" allow for Rose wines to really shine as they pair well with the sunny summer heat. Bodegas Breca delivers a dry rose called Garnacha de Fuego that delivers excellent value perfect for sipping on a hot summer day! Bright and refreshing, with notes of papaya, fresh strawberries and minerality mid-palate. Note: All rose wines should be consumed within 24 hours of opening-otherwise, they lose all their flavour. Bodegas Muga, based out of the Rioja region, also produces a dry rose that is fuller in body, with concentrated citrus and fresh red berry flavours. And speaking of Rioja, this is the trademark red wine that comes out of Spain. Most are composed of the grape varietals Tempranillo and Garnacha, with Graciano and Mazuelo sometimes blended in. An oaked white blend is also made here; however, I'll focus on the reds this time. There are 4 types of Rioja red wines: Joven wines are bottled the year after the grapes are harvested, Crianza wines must age for 2 years with 6 months of that in oak barrels, Reserva wines are aged for a minimum of 3 years with 12 months in oak, and Gran Reserva wines must be aged for at least 5 years, including 6 months in oak. The Beronia Rioja Reserva 2014 is an expressive blend of wild strawberries, red roses, coffee and an earthy note that leads into the long finish. Lively acidity and mocha tannins add structure and complexity. The 2014 is still showing its youth, and would be a wonderful addition to the cellar for another 3-5 years! Pairs well with grilled red meats like lamb chops. Other Rioja wines to try include Campo Viejo Rioja Reserva and Vina Bujanda Rioja Crianza. Stay tuned for next week's wine-down, when I focus on the Reserve line of Mission Hill's wines.